This is it! You have found your true love, so it’s time to pour your heart out for the one who means the world to you and in this case, no day can be marvelous than Propose day. A second day of the Valentine week celebrated on February 8, after Rose Day, giving you another lovely chance to say your girl “Would you like to be my Valentine forever?” Propose day is the perfect time to break the barriers of fears and express those magical words of love to your lady love of your dreams. It gives all the lovers a reason to reveal their true feelings of love, care and affection for the girl you love the most in your life. Love is the air! Yes! On the lovely occasion of Propose Day, let the soothing air speaks your passionate feelings of love and help you to make a nice love proposal towards the girl you love the most in your life. 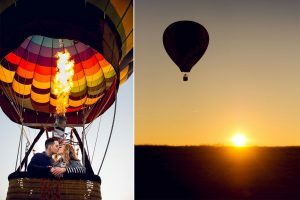 If you are looking for the creative way to pop the question “Would you like to be my girlfriend?” or “Will you marry me?” then why not propose her while on a romantic hot air balloon flight? Wow! That moment will be so awesome! She will definitely say “Yes” to you. But make sure that she is not afraid of heights. If your girl is a nature lover, then Guys, you have got your another love proposal idea. A waterfall proposal is perfect to make your woman feel on top of the world. Take her to the most beautiful waterfall, position yourself to get a good view, bend down on one knee, hold her hand in yours and say her those magical words of love “I Love You.” Such a delicate and beautiful, fleeting moment will sure to make her feel a little bit emotional. Actually, it is one of the most difficult but the fantastic idea to propose your girl. You don’t need to do fancy arrangements, bright decorations and no need to spend a lot. Just go for a walk at the park or famous spot or any place where she loves to go. Wait for the perfect moment! Drop down on one knee and make a nice proposal of love towards her. The rest leave up to her and the crowd saying “Wow” or “So, Lovely!.” The supportive crowd and this beautiful surprise from your side will surely make her feel on cloud nine. This gesture is romantic and perfect in every way. Because of some circumstances of life, you people have to reside away from your lady love who means a whole world to you. But as we all know that no distance can stop your love feelings from reaching to your partner? Come on, you are living in 21st century where artificial intelligence and advanced tech gadgets changing the world. No matter which country or state she is residing, you can now propose your girl with a video call. Expressing your heartiest feelings of love in such a way can be a simple yet lovely way to say “I Love You.” Isn’t it? 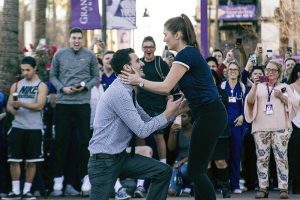 It is the most romantic and surprising proposal idea to express your affectionate feelings of love and making a marriage proposal for your special woman. We have a solid plan that will surely make her feel special. 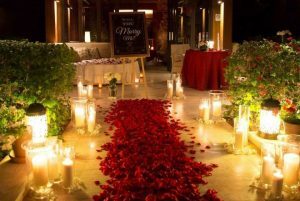 Create a path by scattering petals from the front door to the engagement ring or the place where you have planned a surprise for her. Use more petals to write “Will you be my Valentine forever?” You can also use scented candles or bright, festive lights to trace a path. Go to the beach and write down your feelings on the sand. Tell your sweetheart how much you love her or what she really means to you in your life. 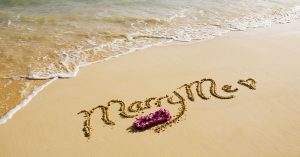 Write the marriage proposal in the sand and gift her a lovely memory along with it. She will surely love this! You can also build a sandcastle together and when she is not looking, put the ring on the sandcastle you have made. This way, you can easily surprisingly express your immense love for her. Really! Every girl would love to be proposed in such a way! Go underwater in style and propose your girl “Will you be my better half?”. You are going to pop the question, how will you propose her without using your voice. It’s simple! You can either take signs with you underwater or write a lovely message on anything which you find perfect. 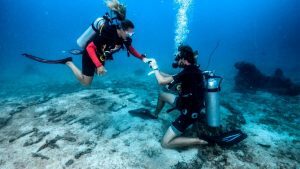 This underwater proposal will be the best experience she ever had and become the best memory of her life. We are sure that she will definitely say yes to you. You love your girl from the depth of heart. That feeling is precious, so it should be spelled out in such a manner that your woman will only say “YES” to spend the rest of her life with you. To increase the charm of this day, don’t forget to shower her with some pretty Propose day gift offered by Winni, a trustworthy gift portal, 24*7 available to meet your gift demands. So what are you waiting for? 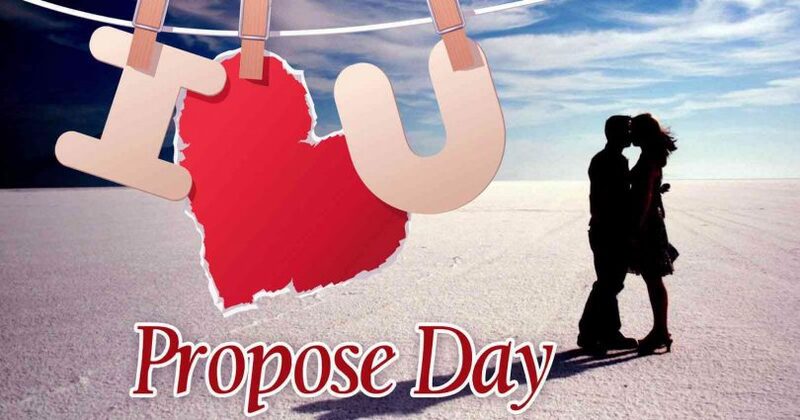 Check out the above-listed romantic ideas to heighten up the spirit of this special day of Valentine week known as Propose Day. Have a great day with lady love of your life!